My husband and I love to travel and we’re always on the lookout for great travel deals. Some times, we plan trips in advance and find the best deal based around the trip we’ve planned. Other times, we find great travel deals and then just throw a trip together around the deal we’ve come across. The latter is how our trip to Vancouver came about. Late in 2015 my husband came across a great airfare deal from Los Angeles to Vancouver that we just couldn’t pass up, so we jumped on it. Besides, Vancouver is one of our favorite cities, so it’s not like its a hardship to put together a nice weekend getaway to one of the prettiest, if not the prettiest, city in the Pacific Northwest. 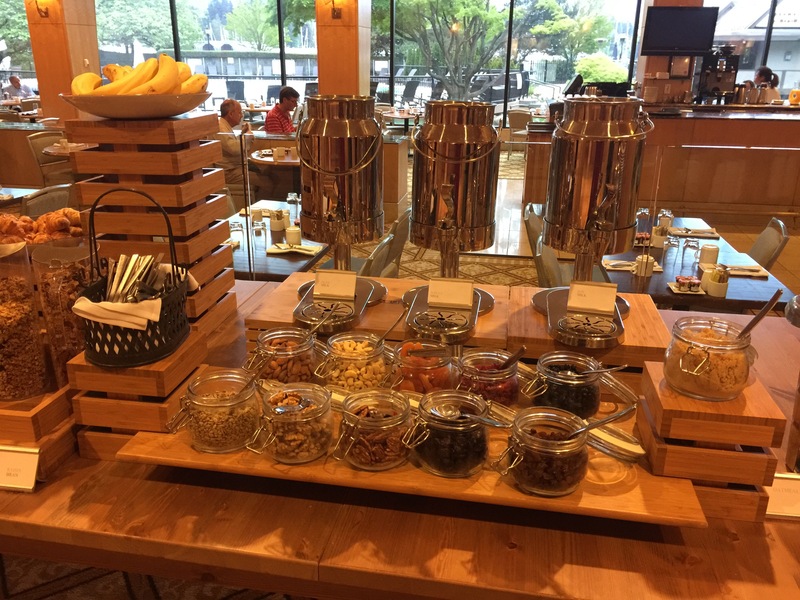 Once we booked our airfare, I knew exactly where I wanted to stay in the city, one of my favorite hotels of all time, the Westin Bayshore Vancouver. 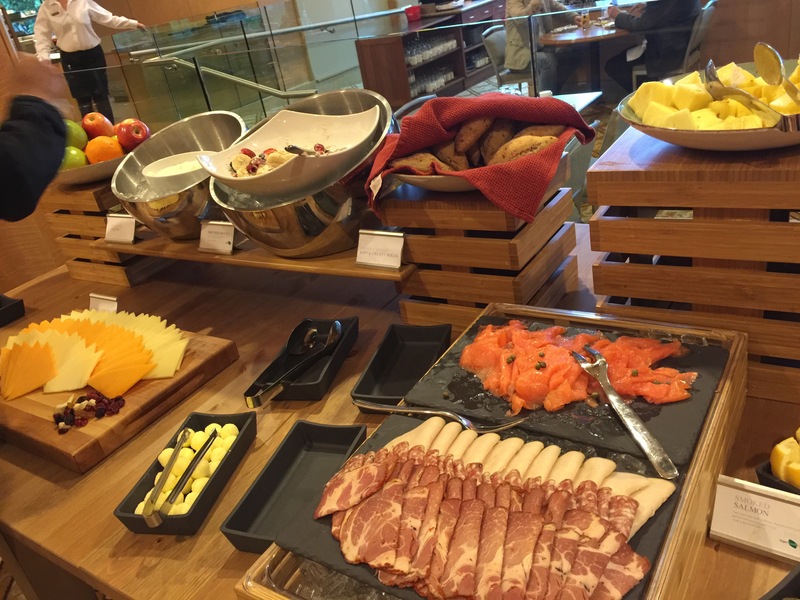 Part of our hotel package included breakfast each morning at the Westin Bayshore’s restaurant, Currents. Aptly named as the Westin Bayshore sits right at the head of English Bay and next to Stanley Park, this is the area of Vancouver where the Pacific Ocean comes right into Vancouver harbor. 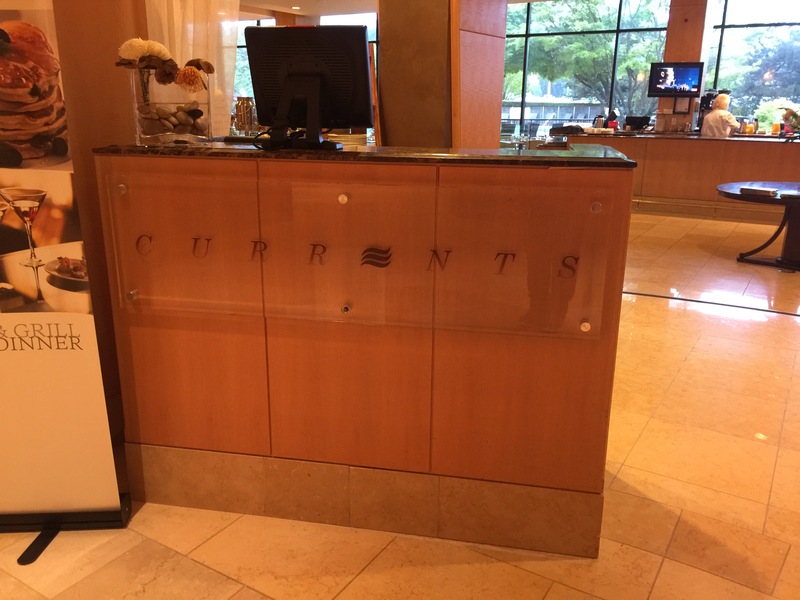 Currents sits at the back of the hotel with large floor-to-ceiling windows with beautiful views of the hotel’s garden, pool and a slight glimpse of the harbor. Set up as a buffet, breakfast each morning offered a wide selection of food, both hot and cold, for everyone to enjoy. Starting with the cold breakfast offerings, there was a selection of cereal, bran and granola with different kinds of milk to choose from a toppings of nights and dried fruit. There was also oatmeal as well that you could top off with nuts, brown sugar and dried fruit as well. 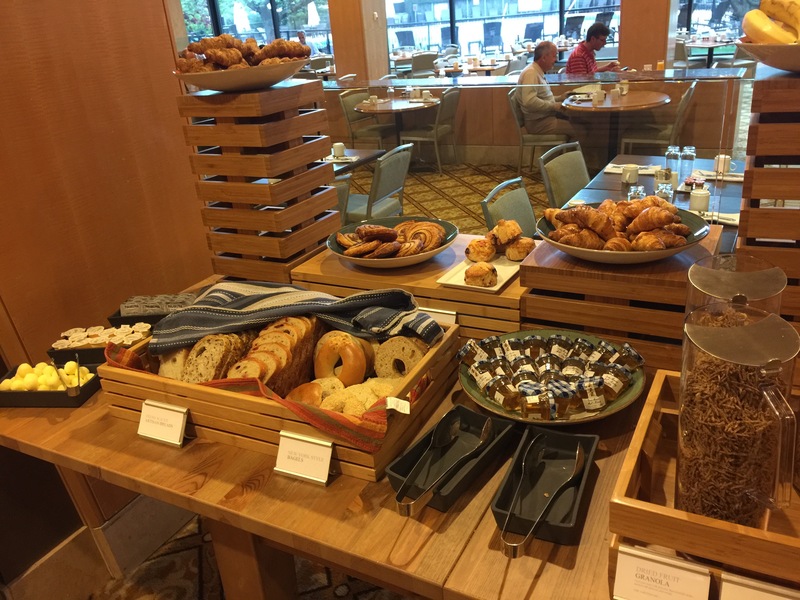 Next to the cereal was a selection of fresh sliced artisan breads (there was a toaster to use to toast your bread), New York style bagels, croissants, scones and other fresh baked pastries. There was also a small selection of individually packaged jars of honey. Further down the line there was a chilled selection of peach, raspberry and no fat probiotic yogurt for those looking for a healthier alternative for breakfast. There was also fresh sliced seasonal fruit that included pineapple, honeydew, cantaloupe and watermelon. Cold cuts are such a popular breakfast item. 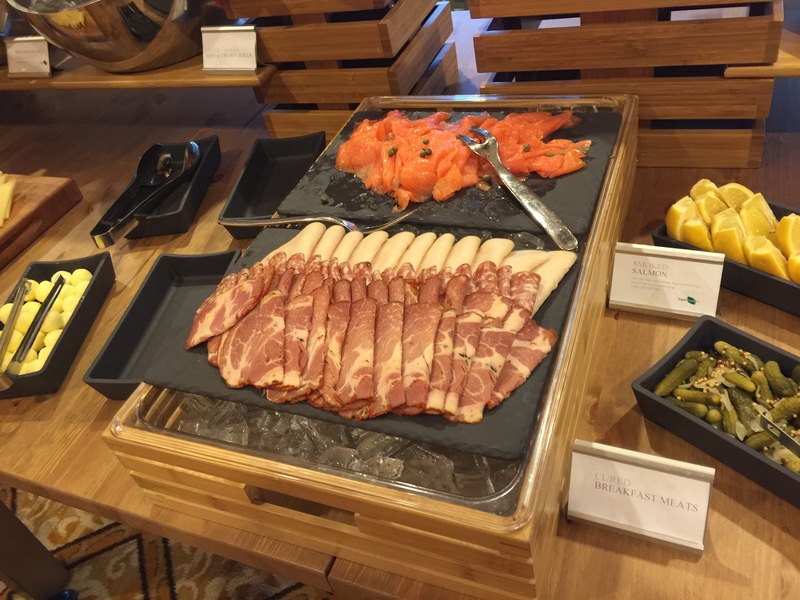 There was a selection of cured meats, and a selection of smoked salmon with all of the fixings of pickles and lemon wedges to top a bagel with or use some of the soft crusty rolls to make a sandwich. There were balls of butter and a selection of cheeses as well if a breakfast sandwich was your desire. 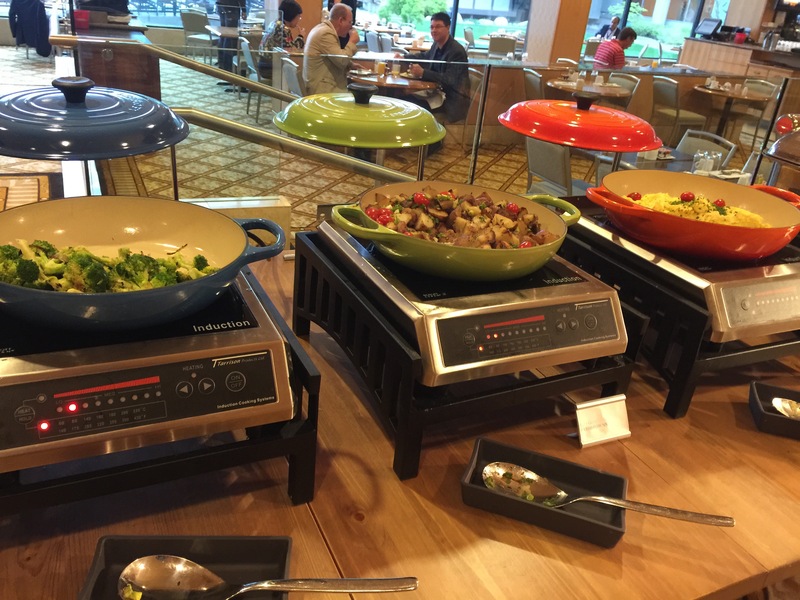 Finally we move to the hot food section of the buffet. You’ve got your servings of bacon and sausage. 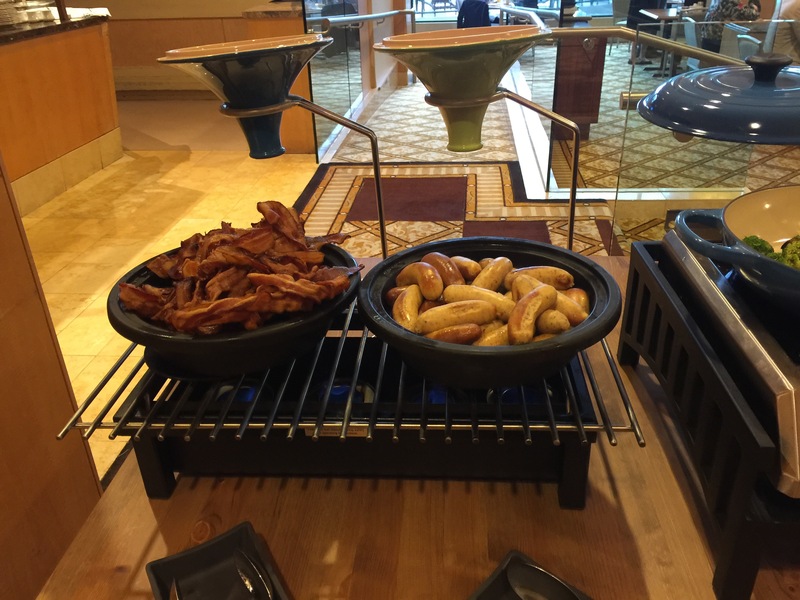 Hard to have any sort of breakfast buffet without bacon. I think the hotel guests would revolt if they didn’t get their bacon. There was also a selection of hot vegetables. The first day we got sautéed broccoli with onions. The next day this was actually sautéed mushrooms instead of broccoli. There was hot potatoes with scallions and cherry tomatoes which were absolutely delicious I had to help myself to a couple of servings of potatoes. But then again, I am a meat and potatoes kind of girl. And of course, you’ve got to have scrambled eggs. 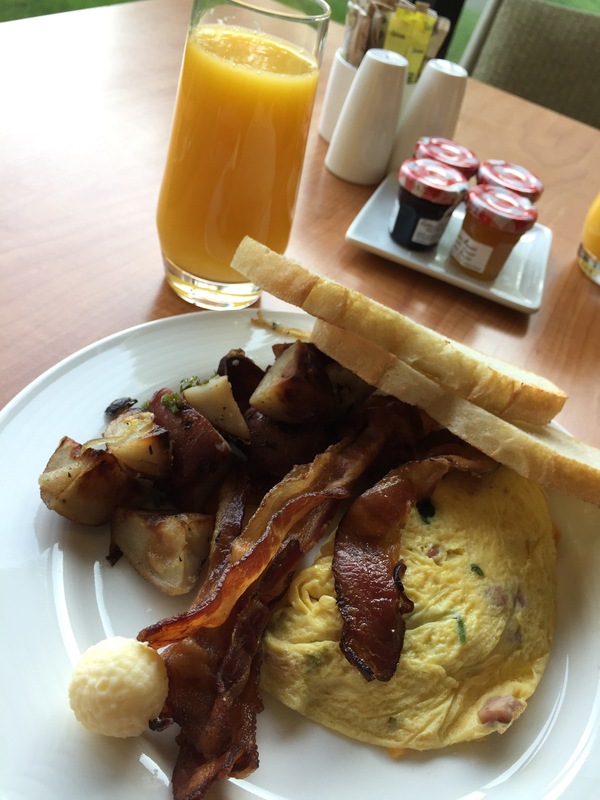 Scrambled eggs are like bacon, you better be serving them or the hotel guests won’t be happy. 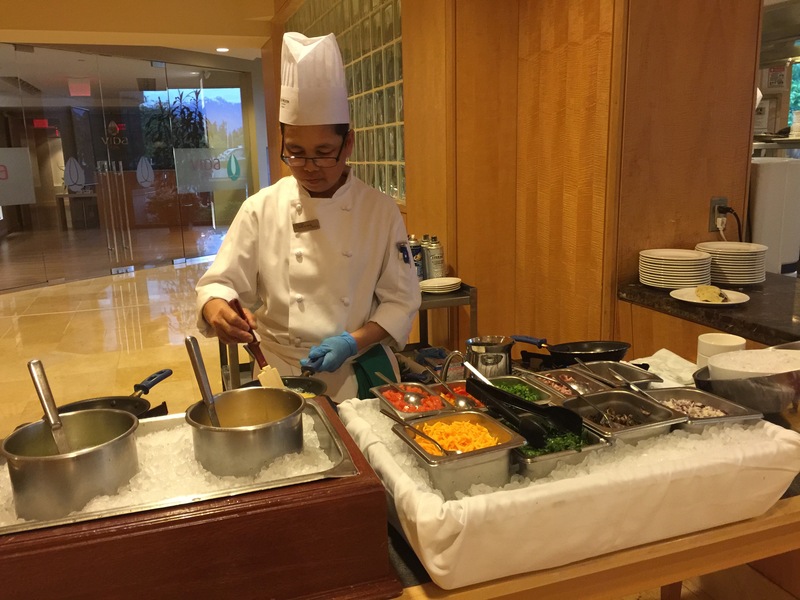 Of course, if you wanted your eggs a different way, say hard or soft boiled or even fried eggs, you could get that at the egg station where the chef was also doing make-your-own-omelets. The make-your-own-omelet option came with a choice of eggs or egg whites with filling options of cheese, tomatoes, ham, mushrooms, spinach, green onions, onions and baby shrimp. Luckily, the buffet wasn’t too busy so the wait for an omelet was only a couple of minutes. I’m an omelet fan, so I had to get myself an omelet. Cheese, ham, green onions in mine would be perfect thank you. Grab some pieces of bacon, a helping of hot potatoes and a couple of slices of toast to go with some butter. There’s already jam in jars on the table for me, and a nice tall glass of orange juice. Perfect. A filling, breakfast of champions to give me enough energy to last through the day. What a nice way to start out the morning. 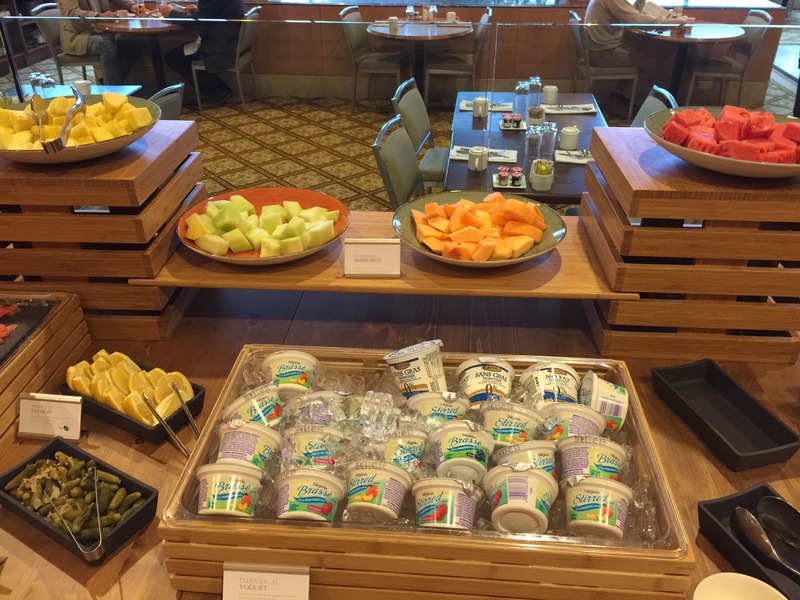 A nice hotel buffet breakfast of some of my favorite breakfast items really can get you through the day. We fueled up each morning at Currents for breakfast before we headed off on our adventures in and around Vancouver. While the buffet wasn’t the largest I’ve ever seen, it didn’t matter because it was filled with all sorts of yummy, delicious offerings that I enjoyed. Certainly, no one would leave breakfast hungry. And really, all you need in the morning is just something to get you going whether that be eggs, or bacon, or yogurt or smoked salmon. A little food in your belly goes a long way. And the beautiful views at Currents is a nice way to start out the day.